Oh, I hear you on the computer issues. Not sure what's up with ours either except that it's frozen about 90% of the time. Makes you realize how much you need the doggone thing! So sorry about your computer problem. Glad you got a new one though. 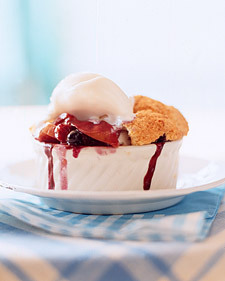 It's hard to live in this world without a computer and it's also hard to live without a yummy cobbler. YUM, YUM…I gotta go make me one…Thanks for the recipe! I've been checking out your blog for a little while, your cobbler recipe is so fantastic I had to comment. I also have little kids and love your ideas. I'm not crafty but I do get tempted to try your ideas. Dang! I wish I had been there. It looks amazing.